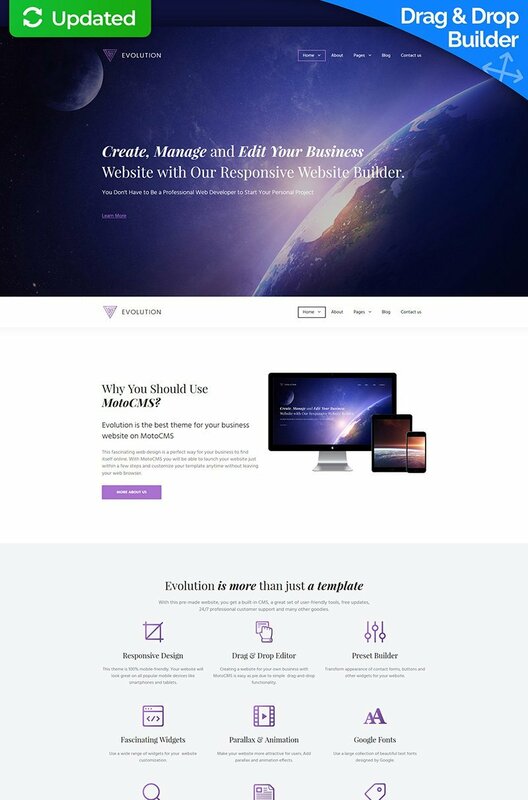 Evolution is a feature-rich and highly responsive business MotoCMS 3 template which offers everything a modern business must have to be successful online. With beautiful interface, conversion-optimized design elements and simple user-friendly navigation, Evolution is deservedly considered one of the most advanced business templates on the market. Use the variety of awesome features like drag-and-drop website editor, 120 pre-made blocks, tons of Google fonts, advanced SEO integration and a wide range of useful widgets to create a one-of-a-kind website which perfectly portrays your business' values and builds trust among your target audience. Should you have any questions or propositions regarding this template, feel free to contact 24/7 Tech Support team — they are always there to give you a helping hand. Everything was perfect. Sandy wa very professional and very comprehensive in the choice of my template. The process is very simple and the template is very practical. our second template from template monster. It has lots of nice features - so many we couldn&#039;t even use all. looks professional and our web is fresh and nice. We do music marketing for bands and festivals in poland, so the blog pages are being used as our press office. have a look at www.halomedia.pl. the support from TemplateMonster is great, they installed the website for me quickly without a delay. The template matches every business owner who runs a serious company. You can create modern, good-looking and responsive website without hiring programmers. I hated wasting tons of money for updating my website. But I had no other way. And I was pretty surprised , when discovered that there is a piece of software that can help me to change my situation this forever. 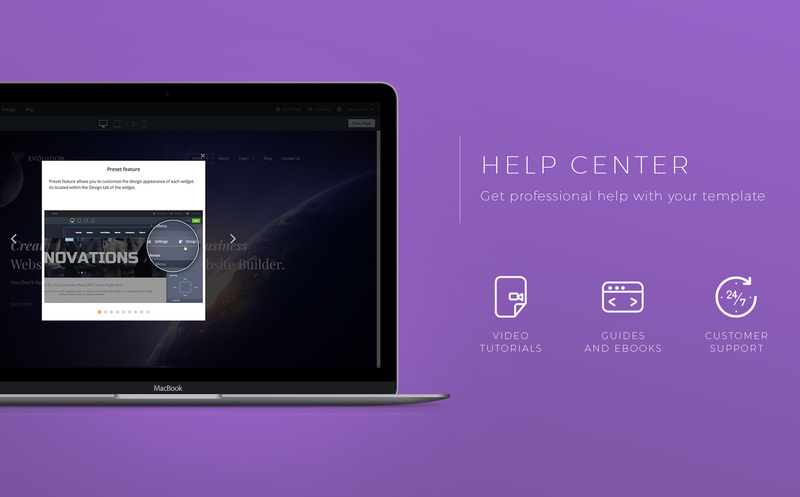 I recommend you to register a free demo of this template and test everything yourself. That&rsquo;s how exactly I got Evolution. MotoCMS website builder is the future of website creation. It is so easy that even a little kid is able to create a website with bare hands. As for this template, it&rsquo;s really cool. You have no necessity for changing its design - everything&#039;s done beforehand. 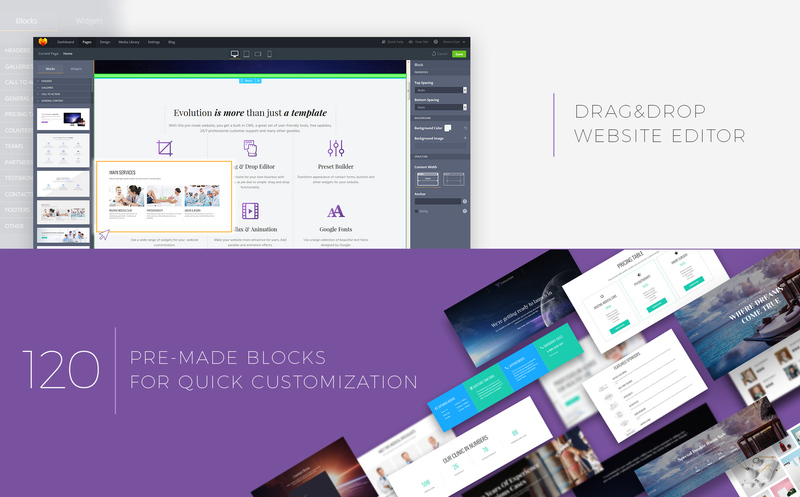 Evolution is gorgeous due to two things: awesome ready-made design and high-functionality website builder. If consider a website as an investment, this one payed off 100%. MotoCMS is a great company with wonderful website builder and beautiful templates. I have already built 2 different websites with the Evolution theme and I think it&rsquo;s just the beginning. When I showed off this template to my clients, they just couldn&rsquo;t say &ldquo;no&rdquo;. The template has lots of pages, responsive design and simply looks awesome! With Evolution you can build your website really fast and get it launched even faster. But the most important is the fact you are the only manager of your website. I hated wasting tons of money for updating my website. But I had no other way. And I was pretty surprised , when discovered that there is a piece of software that can help me to change my situation this forever. Great template for a website with 10+ pages. The system is amazing. No bugs found. Only satisfaction. Modern solution for good money. Think how much you can save in future. If you haven&rsquo;t noticed yet, MotoCMS gets updates from time to time and they are free. A new feature was added to the admin panel. It is an excellent alternative to LiveChat which allows clients to get in touch with you via the most popular messengers and also leave their details for further contact with managers. With the new update, Evolution got 35 new content blocks with the ready-made design. Now you can take advantage of more than 120 blocks to create any kind of a website you want. In the new upd ate for Evolution, there are 2 brand new child pages with original design, so you could save more time on creating a business website for your niche. 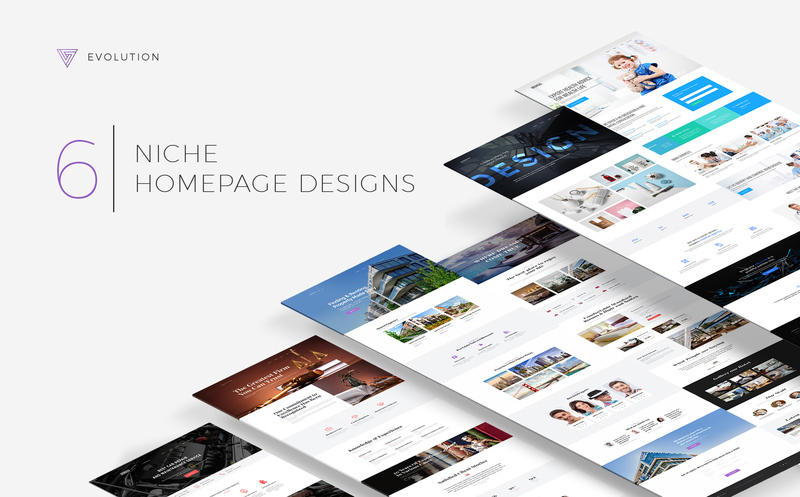 Take advantage of this Moto CMS 3 website theme and its diverse se t of 7 home pages: general, medical, web design, car repair, real estate, law and hotel. After the update Evolution has 5 different home pages: general, medical, web design and 2 new pages: car repair and real estate.